Join thousands of Yogis from ATMAN Federation’s schools all over the globe in a unique summer holiday at Romania’s seaside. A whole month of condensed spiritual activities bringing people together for yoga practice, a variety of lectures, movies, meditations, secret initiations, shows, contests and much more. 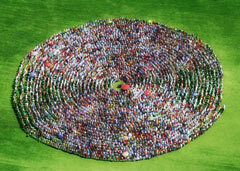 One of the highlights is the annual Yang Spiral meditation with over 5.000 participants.